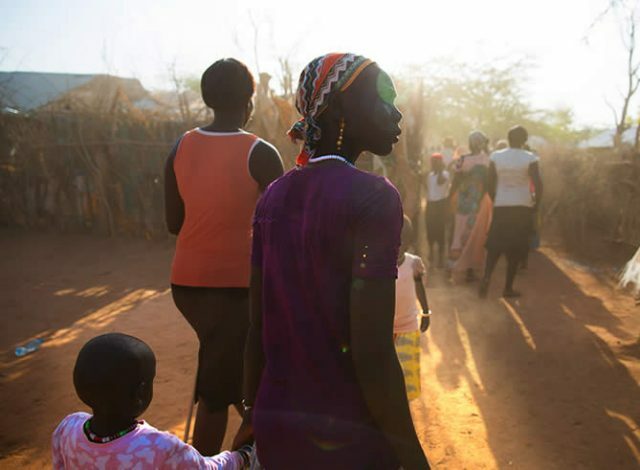 On May 6, the Kenyan government announced it would no longer be hosting refugees, citing reasons including the security threat of Al-Shabaab, the lack of financing and the economic impact of hosting large numbers of refugees. On May 11, the government clarified that they will only be shutting down the Dadaab complex—the largest refugee complex in the world. We visited Dadaab at the end of March with Bono, our co-founder, and met the people, families, generations living there that need the government to reverse this decision. We met some amazing people in the complex- refugees like Victoria from South Sudan, organising and leading her community group with strength and grace. We met Ahmed, a young man who had grown up in Dadaab, married and had his own children there- now working to give educational opportunities to young people in the camps. Life there is hard: only half the children in the complex are being educated, and large families are still on smaller food rations following shortages that kicked in last summer. We witnessed the commendable work by agencies like UNHCR, the UN Refugee Agency and the World Food Programme and others, providing essential services despite thin budgets and escalating crises all over the world. But despite the difficulties of the camp, life back home would be dangerous for these refugees. Dadaab hosts some 350,000 refugees – most from Somalia, with small populations from South Sudan and elsewhere. Kenya—Dadaab—is their home, and should continue to be until the place they fled is safe to return to. Somalia is still largely unstable, with only small pockets of the country deemed safe. Last month, according to international Crisis Group, there were at least 16 attacks in 13 places killing 96 people, with threats of violence a daily feature of life, and little to no government infrastructure to keep citizens safe. Kenya has long been a safe haven for those fleeing conflict, particularly the conflicts in Somalia and Sudan. This proud tradition means Kenya currently hosts almost 600,000 refugees, fulfilling the international obligations the country is bound to abide by. In 2013, Kenya signed a Tripartite Agreement with the United Nations High Commission for Refugees (UNHCR) and the Government of Somalia, in which they agreed to support Somali refugees should they choose to return home. The agreement does however stipulate that refugees have the right to choose whether to go home, after they’ve been given information about conditions on the ground in Somalia. Kenya should remain committed to that agreement. These decades of generosity should continue, particularly at a time when the world’s refugee system is under increasing pressure. Refugees around the world, including these from Somalia, are the victims of conflict and terrorism, and need our protection. In addition, the expulsion of refugees could lead to a humanitarian disaster for the region – neighbouring countries are already shouldering huge refugee populations, with Uganda, Tanzania and Ethiopia alone hosting more than 800,000. We hear and understand the frustration of Kenyan policy makers that their hosting efforts are not supported as much as other regions of the world. We must fight for equitable resources for all refugees around the world, wherever they are. Kenyan civil society, including the Refugee Consortium of Kenya and Heshima Kenya, have urged the government to reconsider its position to close Dadaab. Kenya should consider maintaining its international obligations, and the international community must step up and support refugees wherever they are in the world, including through support for Kenyan refugee programmes and the Kenyan government, and other countries in sub-Saharan Africa in particular that host 27% of the world’s refugees between them.